Tonight's meditation, through 8pm GMT is to send Peace and Unity to all across the globe. For this focus the amethyst cairn here at Old Nisthouse, Orkney, will be used, to which the rose quartz and unikite crystals, shown below, have been added. Please feel free to join us in meditation, positive thought or prayer from where you are based by visualising the image of the cairn below. The cairn will remain open in this way, over the coming week and can be connected to at any time. Tonight's meditation uses a heart shaped chunk of rose quartz to send peace and healing to the Earth and her inhabitants. Please feel free to join us, through 8pm GMT, from where ever you are based across the globe, by visualising the image below in meditation, positive thought or prayer. Rose Heart of light and celestite dust planted 16/01/18 to new area of willow trees at Old Nisthouse, Orkney. This meditation is in connection with all those who have lost loved ones, homes, lands and even countries through recent events, natural causes, civil disrest and war. 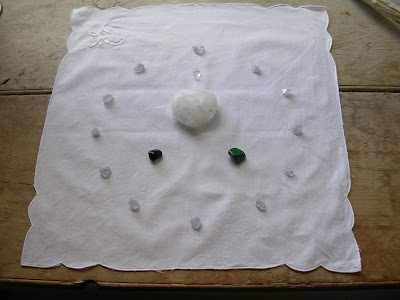 All are welcome to join us from wherever they are based in meditation, positive thought or prayers by visualising the crystals shown below.